Explanation: AE Aurigae is the bright star below and left of center in this evocative portrait of IC 405, also known as the Flaming Star Nebula. Embedded in the cosmic cloud, the hot, variable O-type star energizes the glow of hydrogen along convoluted filaments of atomic gas, its blue starlight scattered by interstellar dust. 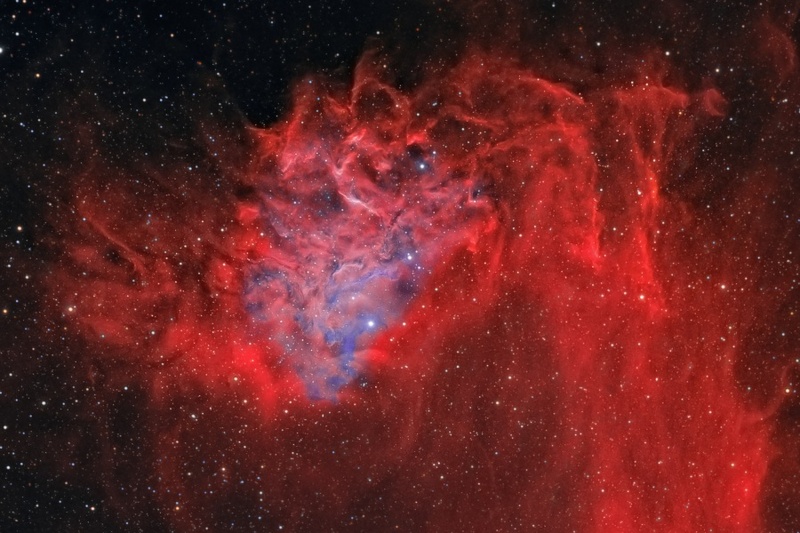 But AE Aurigae wasn't formed in the nebula it illuminates. Retracing the star's motion through space, astronomers conclude that AE Aurigae was probably born in the Orion Nebula. Close gravitational encounters with other stars ejected it from the region, along with another O star, Mu Columbae, over two million years ago. The runaway stars have drifted in opposite directions ever since, separating at about 200 kilometers per second. This sharp, detailed image of IC 405 spans over 5 light-years at the nebula's estimated distance of 1,500 light-years in the northern constellation Auriga, the Charioteer.